According to the rejected 1950 PA compensation form filled out by his widow, he served domestically from Nov 7, 1943 to April 15, 1944. 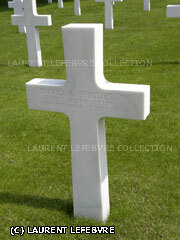 Then, he serving overseas from April 30, 1944 to his death. Perhaps he was too late to train for the D-Day invasion. Born 2 Sep 1915 to David W. and Mary J. (Reese) Phillips in Plymouth, PA. Both parents died after his marriage, but before he did; his mother in 1941 and his father earlier in 1944. He and his wife had one son, David Michael Phillips. She remarried in 1949 to another WWII veteran.